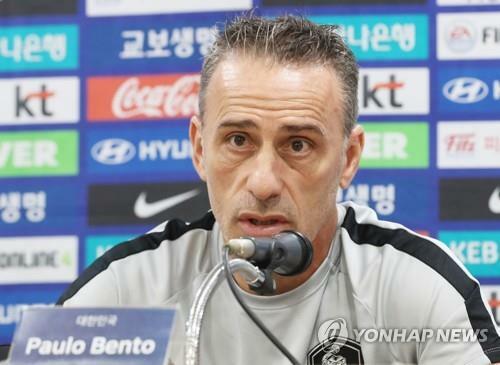 SUWON, South Korea, Sept. 10 (Yonhap) — South Korea national football coach Paulo Bento said Monday he wants to see whether his players can display their style of play against strong opponents in an upcoming friendly match. South Korea will host Chile at Suwon World Cup Stadium in Suwon, south of Seoul, on Tuesday. It will be South Korea’s second match with Bento, who took the helm last month. Bento got off to a good start with South Korea by beating Costa Rica 2-0 on Friday. But Chile are considered stronger opponents than Costa Rica and are likely to give Bento’s side a stern test. Chile ranks 12th in the latest FIFA rankings, 45 spots higher than South Korea. Although key players like Alexis Sanchez, Eduardo Vargas and Claudio Bravo are absent, Reinaldo Rueda’s side still features players like Arturo Vidal, Gary Medel and Charles Aranguiz. Bento said he wants his players to execute the orders he has emphasized from the start — to control the game and create frequent scoring chances. He said that with South Korea, he’s been thinking of football in which every player engages in defense and offense. Bento said all players are physically ready to compete in the Chile friendly, including Son Heung-min, whose fitness recently raised fans’ concerns over his tight schedule of World Cup and Asian Games matches. Bento said he will not dramatically change the team but will upgrade it according to his own approach. “We have to respect previous coaches’ football philosophy, but I also have my own style,” he said. “We’ll keep things that are needed for us, but we’ll try to add our own colors into it. South Korea national football team head coach Paulo Bento gives directions to his players during training at Suwon World Cup Stadium in Suwon, south of Seoul, on Sept. 10, 2018, one day ahead of a friendly football match between South Korea and Chile.